"I would like to take this opportunity to let you know what a great job Greta and Chris are doing in building such a great community of friendly and dedicated runners. 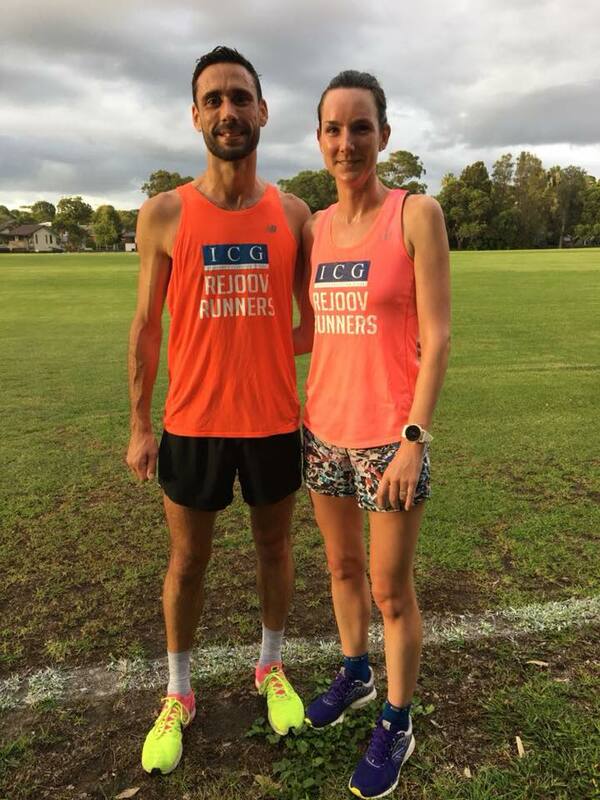 I firstly met Chris and Greta in 2015 when I moved to Sydney and started running with Hurts. Since my wife, Ash and I took regular part to the Rejoov activities including the racing events under the ‘fluro squad’ banner (for the traditional bright pink and orange Rejoov singlets) which provided for great running experiences and camaraderie. The 2018 running retreat in Uluru in particular was extremely well organised and a once in a lifetime opportunity to run the stunning Larapinta trails in great condition! Jerome dupuy & ash ruane - Husband & wife dynamo! — Robin Vonk - achieved another big 10k pb Mar 2016 in 32.59 at the North Head Striders 10k placing 3rd. He was pushed the whole way by Chris. Canberra marathon 2017 3.04 debut road marathon &. Also ran a half pb at SMH half marathon 83.19. Lots more in store for Gidon. "Greta provided a training program that prepared me for the 2017 Canberra Marathon – my first road marathon, which I finished in 3hr 04 mins. In addition to the program I also joined the rejoov crew for several midweek morning sessions in Centennial park. Greta’s program was exactly what I was looking for – structured enough to provide a system for my training, but also flexible to deal with busy weeks, family and social events. Greta was super responsive to any queries and very supportive and positive the whole way through the campaign and past race day. In particular she tailored the program through an injury and recovery period perfectly, as well as through the holiday period when all the routines changed. Rejoov sponsor Himanshu Dua ICG far right after the smh half marathon - proudly sponsoring the race winner liam adams. We are all big fans Liam! — Simon Gilbertson - lives and trains online in Melbourne. He is swift and working on his speed endurance! Cathy Liu: "I began running with Rejoov in October 2017 as I was keen to try track running after only focussing on road running for the last 4 years. I was feeling quite nervous and intimidated at the thought of track racing but Greta was always such a calming, cheery and encouraging influence. The track training sessions were the perfect preparation both physically and mentally. Greta makes sure the environment is fun, relaxed and encouraging, while still pushing us to work hard and give our best. The other Rejoov runners were a joy to train with as everyone is so supportive of each other. These sessions quickly became the highlight of my training week. Following the track season, I began following training programs prescribed by Greta to work towards new road racing goals. These programs are great as they are tailored to my circumstances, including my goals, injuries (both previous and current), any injury-prone areas and schedule. Greta is a very attentive and personable coach, checks in every week without fail and adjusts the program as needed. She is also always open to discussing any ideas or thoughts I have (no matter how crazy they were!). During my time under Greta's tutelage, I always felt the belief she had in my ability to reach my goals (which was often more than the belief I had in myself) and I was always encouraged and cheered on every time we hit a hurdle. It's no surprise that in the few months that I've been coached by Greta, I got a 5k PB (18.15) and, ultimately, a 38 second 10k PB (37.39) despite a preparation that was hampered by a hip injury. In short, I can't thank Greta and Rejoov enough for the new running experiences I've gained, all that I've learnt and all the friends I've made in the last 8 months". Running is the way to your better self [following Juny’s 10k pb in the Cadbury Marathon Festival in Hobart Jan 2016]. (She then had a half mara pb in Canberra festival then her debut marathon at Gold Coast) I am so happy Greta, you are the best coach. I can’t thank you enough, I feel really lucky having you with me the whole journey.